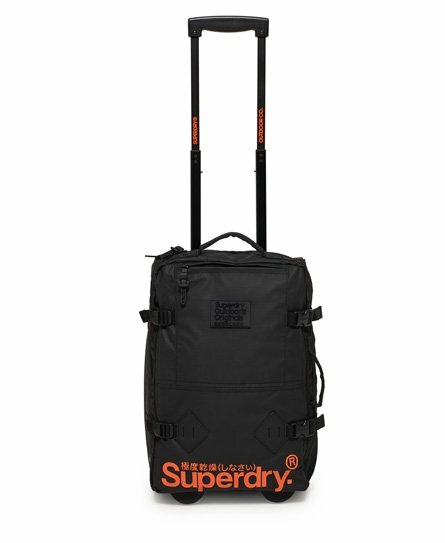 Superdry men’s Travel Range small cabin suitcase. This pull-along case is the ideal travel companion for a weekend away. On the outside the bag has a front pocket great for keeping travel documents safe, a side handle, a top handle and an adjustable handle allowing you to pull the bag along. The case also has an adjustable waist belt. Inside is lined with the Superdry iconic orange colour, with inside fastening to keep all your items in place and two large pockets. The case is finished with a contrasting colour rubber Superdry logo on the front and a Superdry Outdoor logo badge also on the front.